​In real life (when our house was made of bricks and we had jobs), if at any point I checked the calendar and saw that sociable Jot has scheduled us for more than one activity across a weekend I panicked. And moaned. My ideal weekend would be completely free with the knowledge that people were around to eat and get drunk with if I so desired but that the majority of my time could be spent in front of the TV. Pretty Little Liars isn’t go to watch itself now is it. And knowing who Gossip Girl is was a necessity not a choice. But we live in a bus now so there’s no chance of a hectic social life. Or so I thought. Towards the end of Feb and a few days after we got back from Tassie, Jot whipped out a calendar. I didn’t even know we had a calendar. Why would we need one? All that was written in my mental diary was ‘get some kind of job’, under the date of ‘one day’. “We’ve got a busy few weeks coming up”, Jot informed me. “How busy?”, I asked suspiciously. “We’re doing something every day for the next three weeks”, was the unexpected answer. How can that be possible? 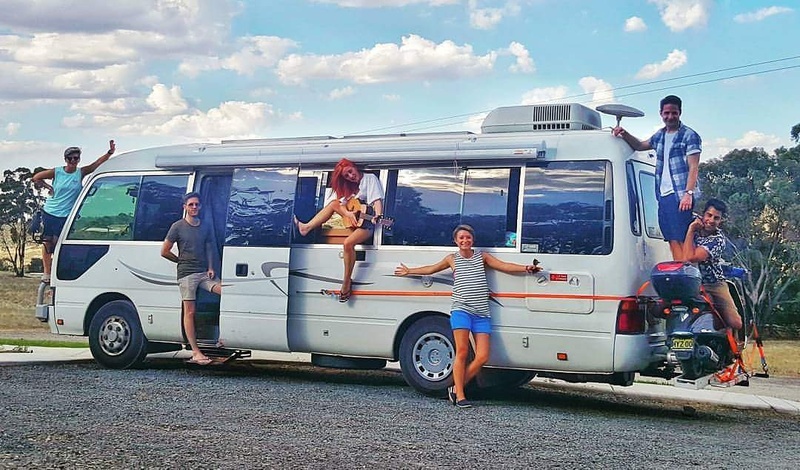 We don’t have jobs, our budget doesn’t really allow for anything other than food and fuel, and we live on a bus that’s in a different country or state to anyone we know. But busy we were. 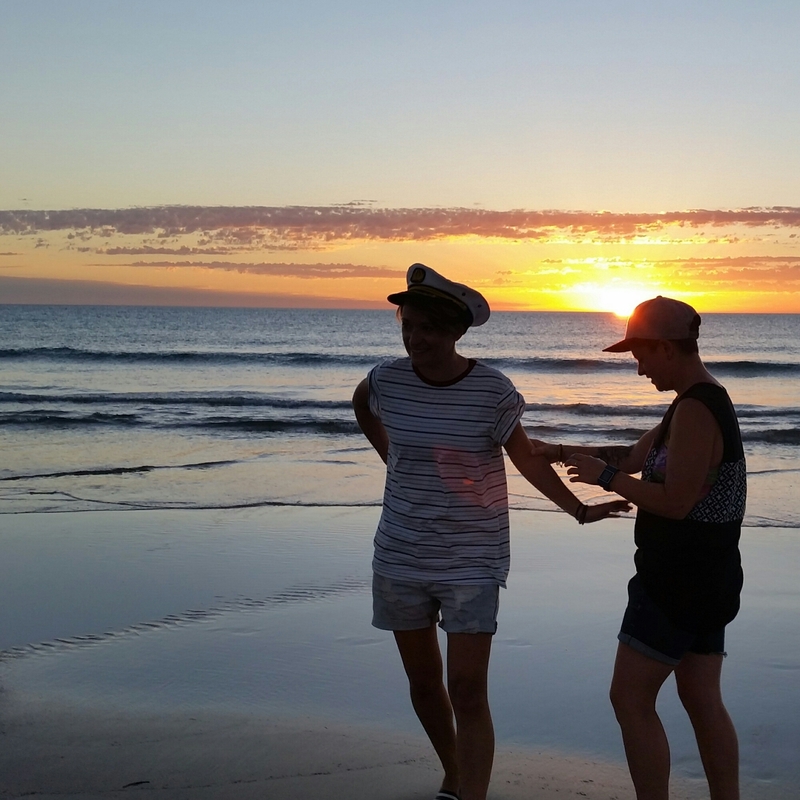 Jot showed me the schedule that included 2 wine tours, a quick flight back to Sydney from Adelaide, meeting friends from overseas, a NSW roadtrip, countless dinners, a concert, three festivals, five shows and a wedding. Having become used to nomad life and just having Jot to talk to I was afriad of this shift in gear. When would I run each day? Would I have to drink every day? Would I be forced to eat carbs thus ending my two month long health and fittness regime? Would I remember the art of conversation and how to put make up on? The answers are yes and no. Yes I would have to drink, yes I would eat carbs, all the carbs, no I wouldn’t run every day and no I wouldn’t remember how to put eyeliner on. But I would have fun, all the fun, and I would remember how awesome, kind and funny all my beautiful friends are. 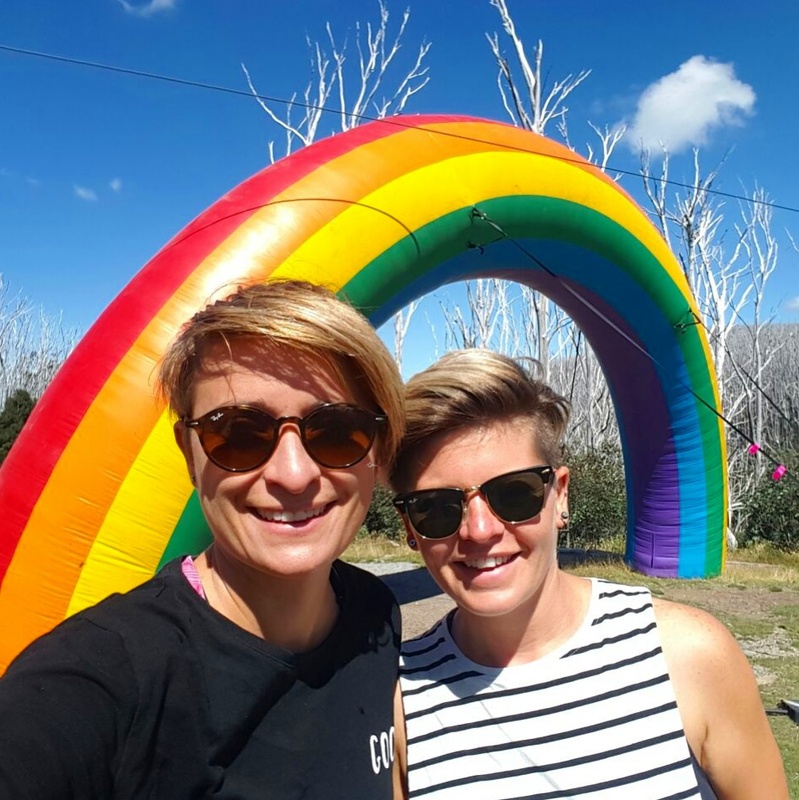 We kicked off with the Gaytimes Festival. That was up a mountain in Victoria that turned out to be too cold for Kath and Anne. We were in bed by 11 and just aren’t gay enough for Gaytimes. 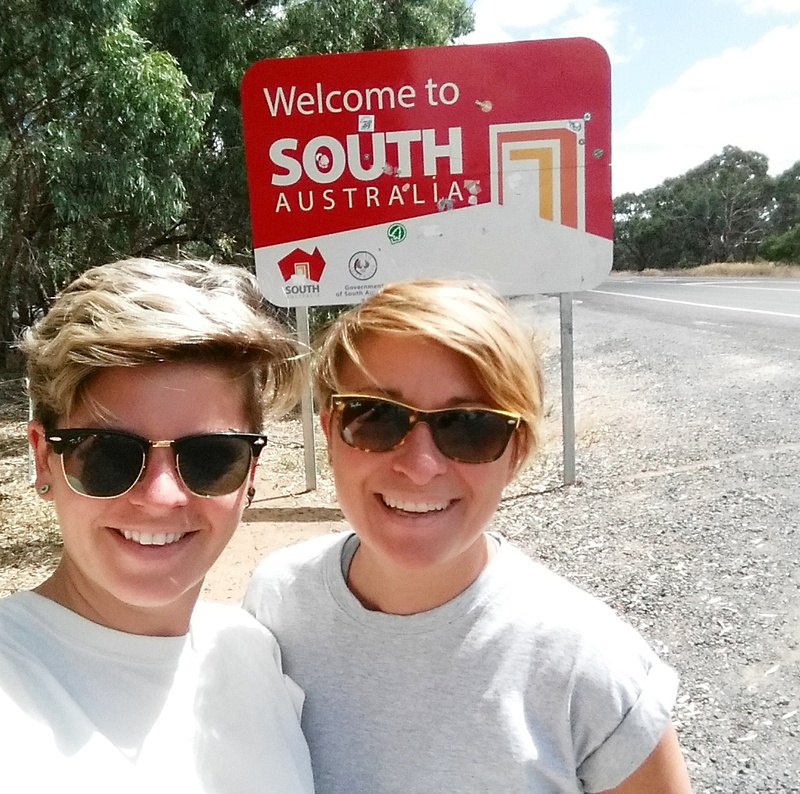 Then we headed to South Australia with our now token photo at the state line. Via Murray Bridge we made our way to the capital, Adelaide. Home of the Adelaide Fringe and WOMAdelaide, and somehow we had media passes to both. The first show we saw was a Jonny Cash impersonator. It was us and about 100 people in their 50’s in the basement of a quirky, pricey resturant. Jot looked alarmed as I started to sing along but I’ve been a secret fan since watching Walk the Line. The next night saw us at at a magic show. A German man and woman thrilled a crowd of about 30 of us in a tiny tent as they performed their old school magic of disapearing bow-ties and multiplying bottles. I tried to stare at the guy’s bow-tie to see the point that it unravels but I had no chance. It must be magic. 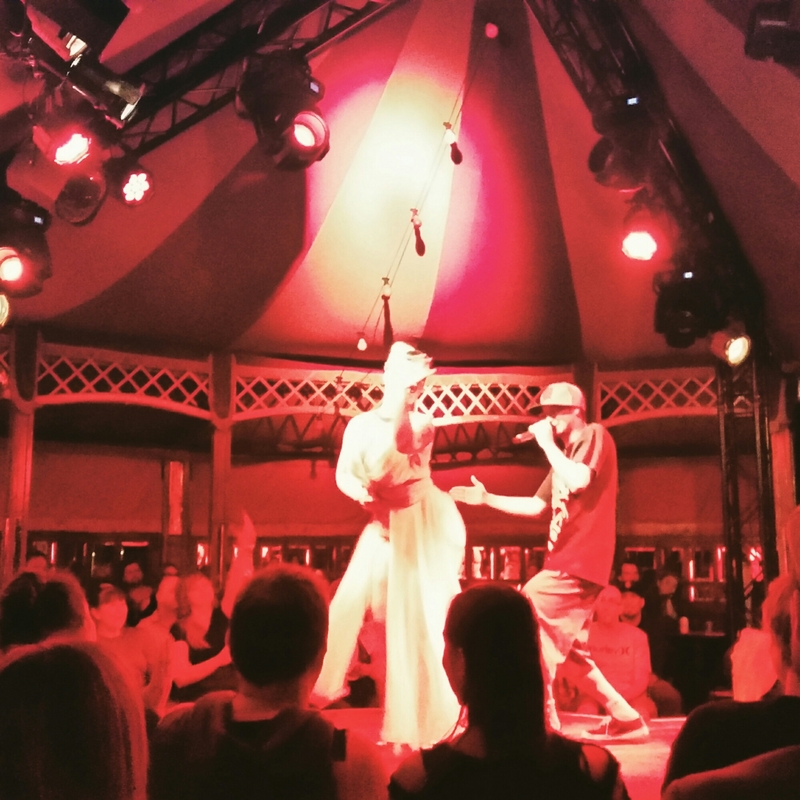 Our third show was in the spiegeltent which for an inamate object, we always get over excited about. We once stumbled across this tent in Hyde Park in Sydney and as we were a few bottles in at the tine we shimmied over the fence to get in. It turned out it was free entry and the gate was about 20 meters away from us so our catlike entries were a bit unnecessary security explained to us as we landed at their feet. Anyway we found ourseleves with a peculiar mix of people slow dancing in the tent and had ourselves a grand old time. Then, when we went to go back the next day to see it in the daylight, the whole thing was gone and it was as if nothing had ever been there. So the spiegeltent has always had a magical alure to it. This time it wasn’t a magical show but an unusual combo of burlesque and hip-hop. Somehow it worked. And despite the douche bag behind us shouting out “they’re just fat strippers”, the spiegeltent once again entertained us and I managed not to throw my precious glass of wine over the man. Saturday was a double show day. Morning run out the way and Jot and I were doing what had now become our daily power walk into the city center. As we were parked 30 minutes away from where most of the shows are but too poor for ubers or buses the show schedule was putting my daily step count at about 35,000. First off we saw a show called Attic which was acrobatics and theatre. A combo that can never fail to impress. The performers muscles were practically popping out their skin. When one guy took his shirt off every woman over age 15 gasped, including Jot and I. No self respecting Brit can have not seen at least a handful of the 12 episodes ever made of Fawlty Towers. Dated of course, but a classic, Basil, Sybil and Manuel can always be relied on to entertain. That Saturday we had tickets to the show we were most excited about, The Fawlty Towers Experience. And an experience it was. 100 or so diners sat on allocated tables of 10 while the three actors, all a spit of their characters, proceeded to drop plates, embarass show-goers, scream abuse at each other and generally recreate the familiar scene from their restaurant. It was a great night and well worth breaking our two weeks of vegetarianism for. The people who did opt for the veggie option were served a raw potato. The other show that really stood out was Cirque Africa. 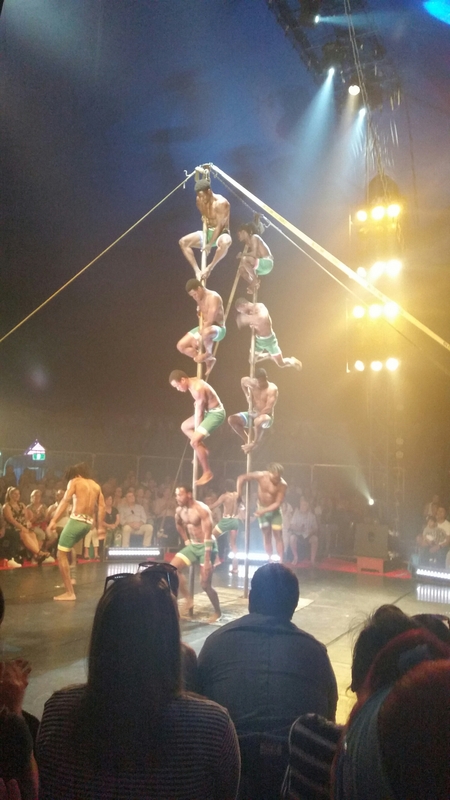 These were the guys who effortlessly hauled themselves up 25ft poles, used each other as climbing frames and made themselves into massive human pyramids, 5 men high at a time. The women in the group were masters at juggling, while spinning tables on their toes. As you do. We left determined to find our hacky sacks out the toy box on the bus. That was three weeks ago. After Cirque Africa we were all showed out. At least for the next week. Waiting for us in a nearby bar with a gin and smiles were Sydney-abandoners Kim and Guiseppe, and Chris and Jai. These were the first people we’d seen since Jan who we actually know! Highly over excited at the reunion Jot forgot all her words and made a few failed attempts at catching up before sitting silently beaming at everyone. 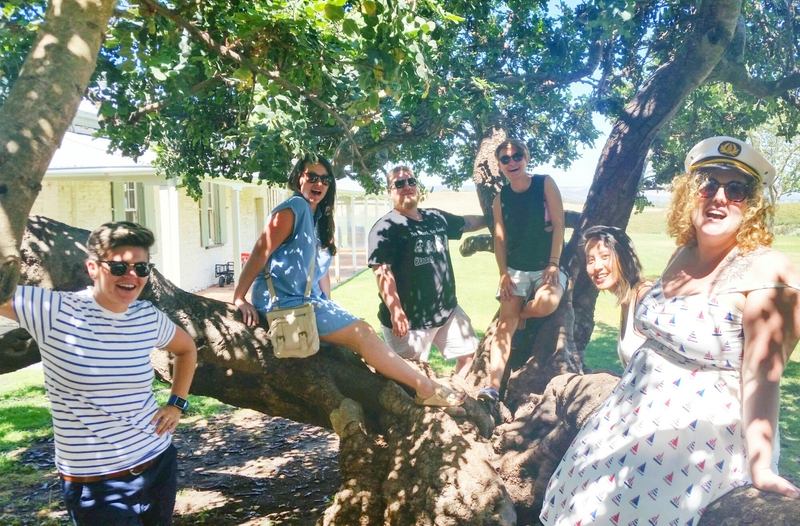 The six of us hit the Clare Valley the next day for a day long wine tour. Designated driver, Chris, drove us from winery to winery and the rest of us got drunker and drunker. We managed to hold on to just enough sense and soberness to enjoy an amazing lunch under an olive tree overlooking some vines. A beautiful seeting with gorgeous people. It all fell apart soon after as we drank our way through the days purchases. The next day we found ourselves with two stowaways on board. We were in charge of Kim and Guiseppe for two whole days! So we terrified them by taking them to a tiny town in the middle of nowhere. It was the standard Australian small town set up. Gas stations on one side of the road and bakeries on the other. We harshly, and fortunately wrongly, judged the small town and campsite and worried we’d be killed there. On opening our eyes and looking around we realised we had once again stumbled across a beautiful piece of the country. We popped up the tent we keep in the bus as the spare room and that was Kim and Guiseppes new home. Intrepid campers they are not and on the first night we were awoken to the cry of, “Jottle, Jottle, I think there’s a dingo outside my tent”. There was not so they managed to survive that night and had nailed it by the next. But still insisted on sleeping in jogging bottoms, sweaters and hats depsite the 30 degree heat. We had a lovely time playing cards, catching crabs, setting crabs free as we couldn’t bring oursleves to boil them, then eating crabs strangers had given to us, thinking that there was no way us 4 with our London accents would manage it ourselves. 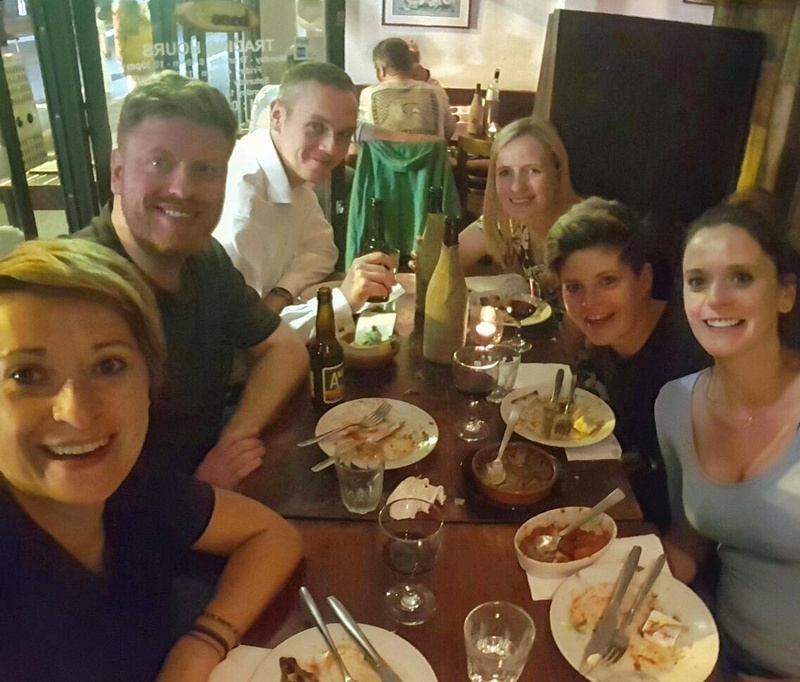 It was pretty awesome to be able to show our friends, who we normally roamed the bars of Surry Hills with, our new way of life. We then left bus. And for Jot and I it felt more like abandoning him. Every day we worried he’d be stolen, or was sad, or would blow up in the 37 degree heat. But bus had to stay in Adelaide Airport car park for 6 nights while we jetted back to Sydney. The reason for our whirlwind trip. 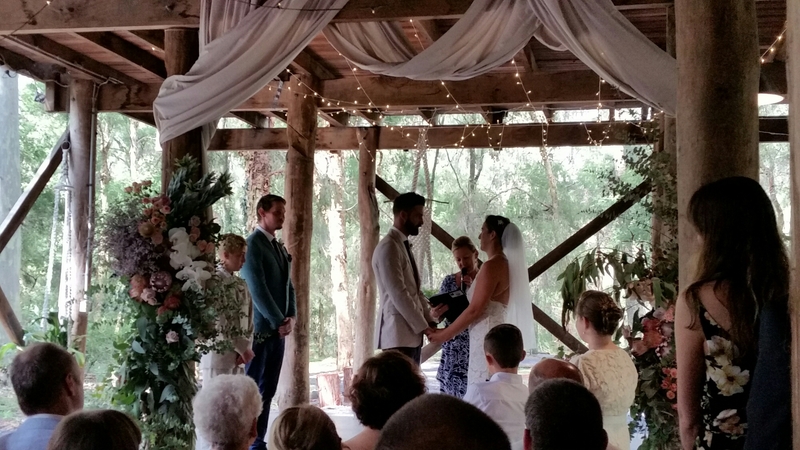 The wedding of two of our favourites, Lucy and Rikki. And a trip to our favourite sushi train in Newtown of course. With some minor wedding faff such as Jot returning her outfit, then returning it again, and once more for luck, we were on the road on the way down south to Jervis Bay. Clong entertained me with updates and gossip while Jot snoozed in the back. The three of us stopped at what has somehow become our regular Hungry Jacks pit stop, about 2 hours down the Pacific Highway, where Jot and I convinced ourselves that it made the most finanical sense to get the 5 item meal. Each. We needed a burger, nuggets, fries, a coke and an ice cream a few hours after breakfast it seemed. Before getting to the cabins we’d booked we took a quick detour via Target. What wedding outfit is complete without $10 children’s wellington boots? Certainly not any of us threes, or the other wedding guests we bumped into in there. Fortunately they weren’t needed in the end as there was only a quick downpour during the gorgeous wedding in the woods. I’ve kept mine though, for when I become a professional fisherperson. Which is as always, just days away. 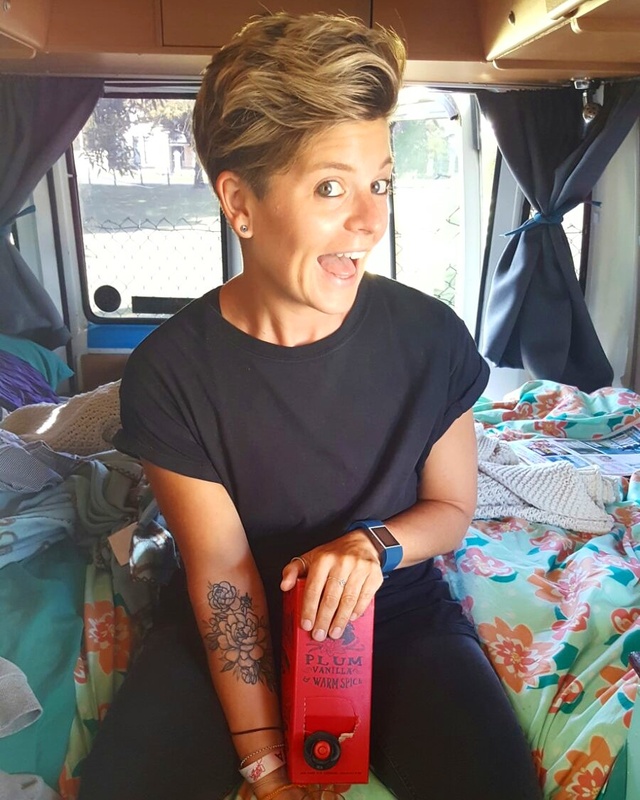 After hanging out with Aff and Dan, and catching up with Holly and Jon, and of course having quality hangs with Bella the dog and reassuring her that she’ll still be our favorite niece when the new baby comes, we flew back to be reunited with Bus in Adelaide. It hadn’t exploded and was happy to see us. No rest for the wicked as Gabs and Jean, and Pot and Jamie were hot on our heals. 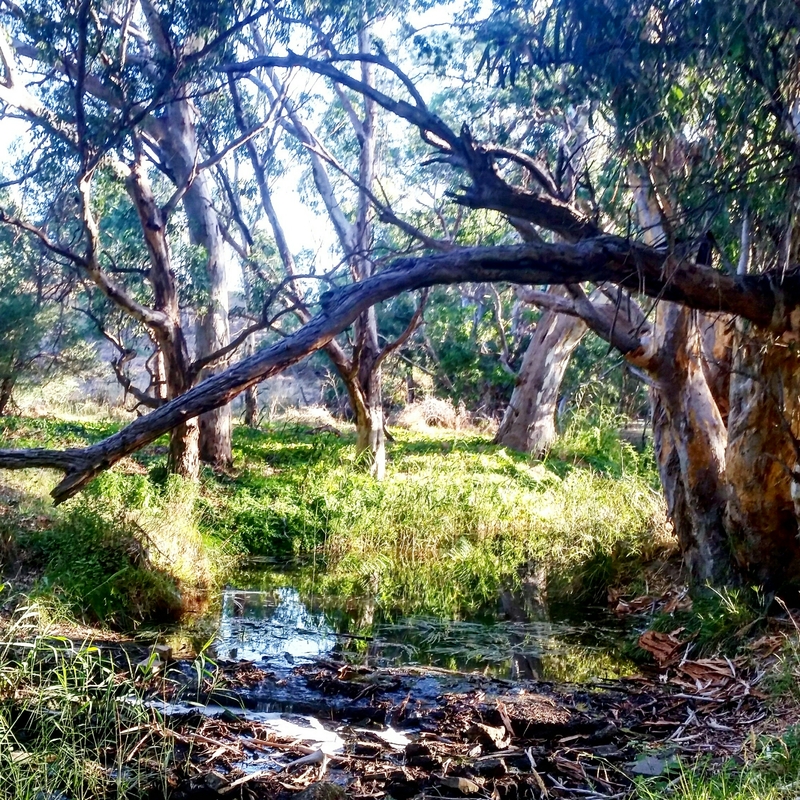 We were all reunited in the McClaren Vale, yet another of South Australia’s wine regions. Here we had a driver to chauffeur us around as we drank the day away. I would write more about the wineries we visited but I only remember up to lunch time and wearing a sailors hat. A drunk swim later and we were ordering 4 party pizzas for the 6 of us. 1 would have done but you live and learn. And what catch up with this lot would be complete without the party being declared a ‘No Pants Party’ and most of us stripping down to our undies while dancing. Gabs was the first to fall and fell asleep clutching her new love, the portable Dyson that had been her dancing partner for the evening. Pot and I were the last women drinking, much to her regret I suspect as she threw up in the street the next day. Pot and Jamie headed home the following day. Gabs and Jean stayed and climed a mountain in record time. 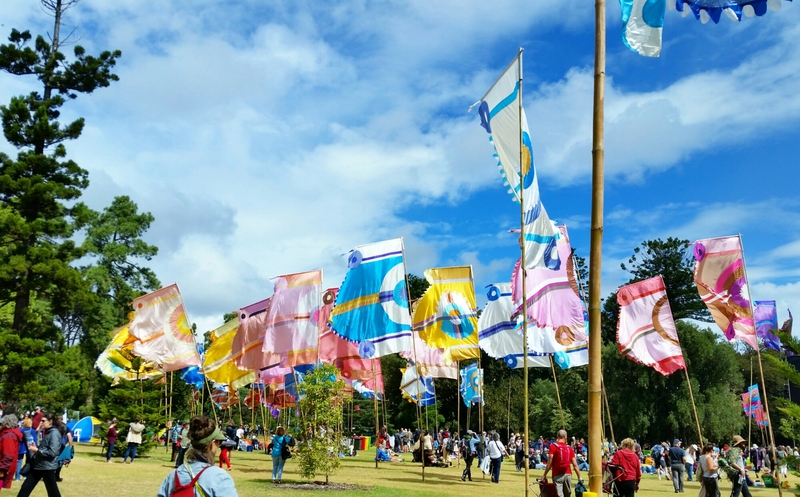 And Jot and I went to Womadelaide, a world music festival. We spent two days there dancing to music we’d never heard before, drinking chai tea and treating ourselves to festival foods. From time to time the heavens opened. Conveniently we’d taken up residence in the park right outside with a magpie as our neighbor for those few days so we could abandon the other festival go-ers and hide out on the bus during the downpours. 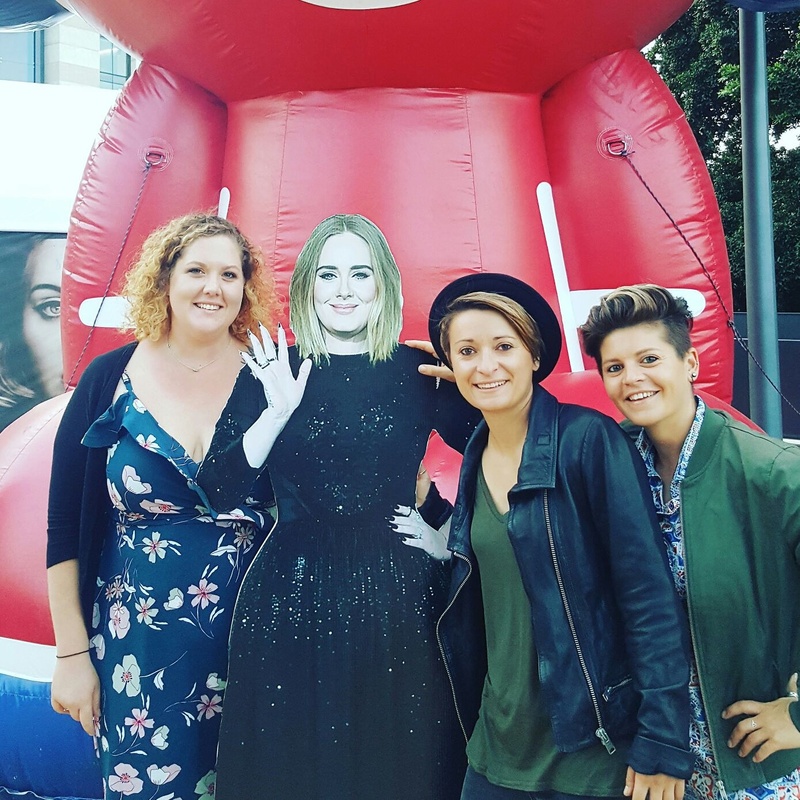 We wrapped up our month in Adelaide in style with Adele. Us and 80,000 others at the Adelaide Oval that is. We sang along and danced in our seats as we drank our plastic bottles of bubbles. The after party took place on bus and lasted till 3am. A fitting way to spend our final night with the last of our visitors. Jot and I woke up in a boiling hot bus that smelt like a 17 year olds secret booze stash from where I had knocked over a bottle of Malibu. So then we were two. Three including Bus, who totally counts. 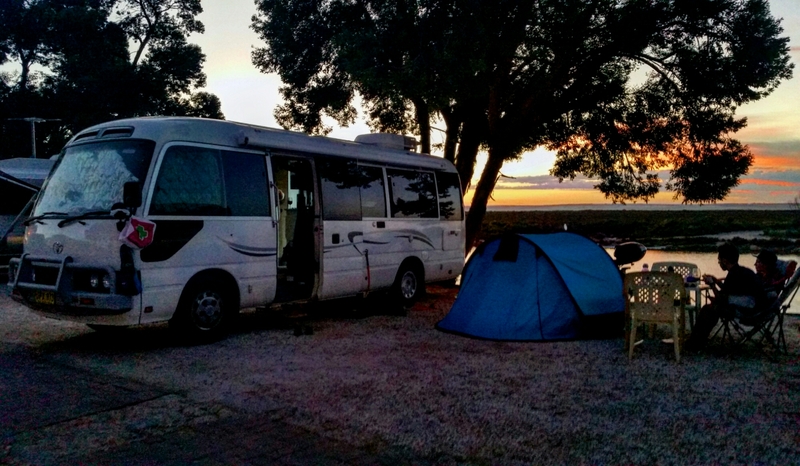 We are now just chilling down the south coast of South Australia about an hour from Adelaide. Our days of eating, ambling and running have returned. 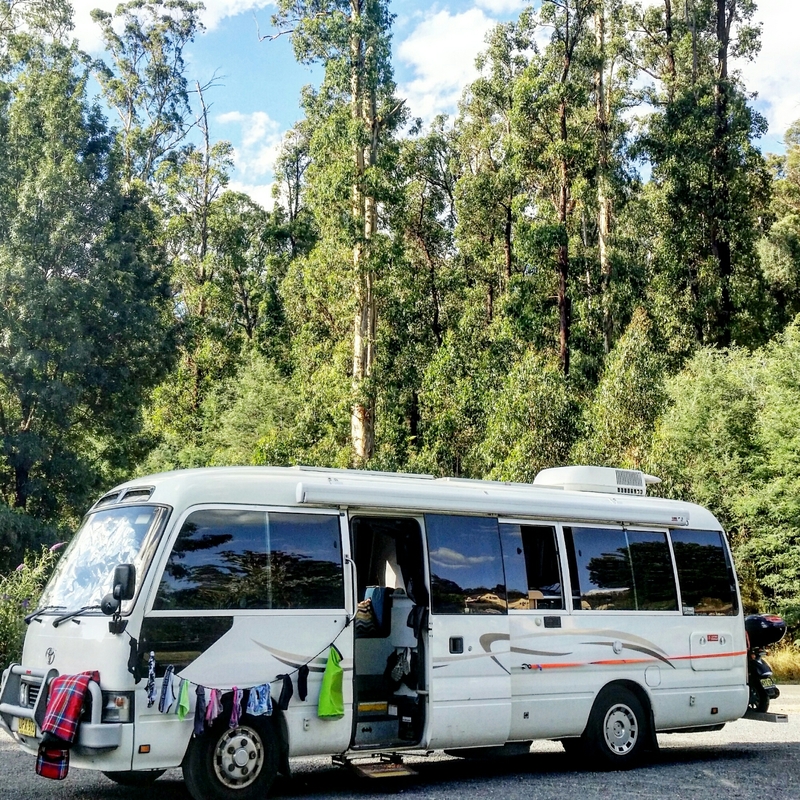 As the SA wardens are pretty strict on free campers we’ve actually had to pay for sites over the last 4 days – shock horror. Although money well spent as I have minor injuries from spending the day slidding down the giant water slide at the campsite we’re at. Tomorrow we’re going on a sunrise adventure. I’ve even set an alarm, which hasn’t happened in a while. We realised earlier that we don’t have anywhere to be now, or ever again, and we should get a map and put a bit of a plan together. A bit of a scary thought that the calendar is now empty again. Catching up with our friends reminded me that we’ll always have a home in Sydney even if we don’t actually have a house there. Where to next I wonder?? I didn’t say what kind of record it was. So wild , crazy and positive trip! I love it!